What TV Secrets Are Hidden On Sargasso Planet? What's happening 224 days from now? Why does no-one else remember classic SF show Sargasso Planet? A new fansite for a possibly fictional TV show from the past may offer hints at one of next year's most anticipated new series. If you are a SARGASSO PLANET fan or merely curious — friend me on FACEBOOK, follow me on TWITTER, checkout my FLICKR feed, etc. Like I said this is only DAY ONE and you never know what kind of random blah-blah-blather I might post. 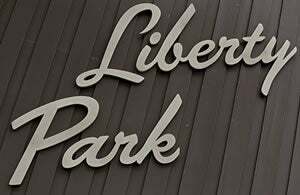 Adamski is, as a Google search will tell you, one of the characters from Jesse Alexander's new NBC show Day One, and the Flickr link includes an image of Liberty Park signage... that being the apartment complex that houses all of the leads for the show. Which makes us wonder what other Easter Eggs are available on the site: are the Sargasso Planet prototype toys early glimpses of Day One's aliens? Is the countdown clock on the front of the site to the show's launch, or something else entirely? And, really, what the hell is going on in this postcard? Day One launches on NBC next year. Zack's site is available now to be picked apart and studied.